Home / Food and Drink / Coffee or beer: What helps you live longer? 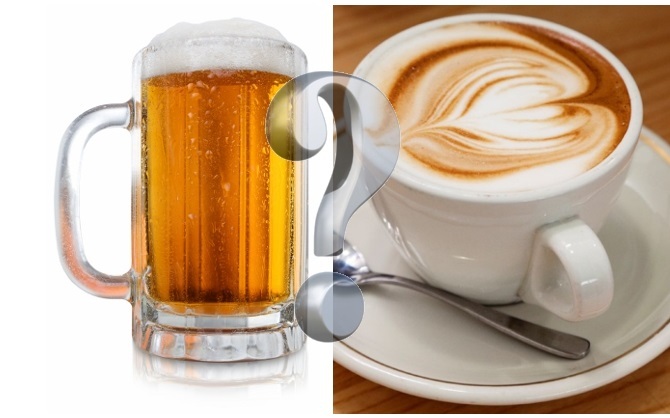 Coffee or beer: What helps you live longer? Whenever you consume beer responsibly can help us extend our lifespan and enhance our creativity, because it promotes neuronal connections. Undoubtedly, coffee and beer are two of the most popular beverages worldwide. According to estimates, by the year 2010 there were about seven million tons of coffee, beer while a staggering more than two billion hectoliters. This means that each person consumes an average of 1.3 kilograms of coffee and 30 liters of beer. Producing countries of the world’s leading coffee are Brazil, Vietnam and Indonesia and beer: China, United States and Brazil. But what helps you live longer, coffee or beer? Provided they are consumed in moderation, both drinks provide multiple benefits for human health. However, there are still many myths about it. Overall, beer contains a lot of water, so that keeps us hydrated; It is low in sodium, an element that prevents fluid retention; by its high content of potassium is an excellent diuretic ; moderate consumption helps people suffering from hypertension and cardiovascular problems, mainly because it has no cholesterol; It is a good source of energy, keeps bones strong and a good memory, plus it has effects antioxidants. How do these drinks affect the brain? Also, some studies suggest that beer and coffee differently affect our brains. The beer acts directly on the cerebral cortex, which is responsible for imagination, perception, judgment and decision. Therefore, when a minimum amount of this drink our brain you can ignore what is happening around, promoting best neural connections taken. i.e. drink two beers can help us boost our brain and, thus, be more creative and generate new ideas. By contrast, caffeine binds to brain receptors, causing the body to raise its amount of energy. Because of the speed of its effect, soon after drinking a cup of coffee we will have more energy and ability to concentrate. In conclusion, the coffee is very good for developing and implementing ideas that we had previously thought .Despite all this, we must be careful because too much coffee can cause the body to become resistant to caffeine, so it will take much to produce the same effect. Although moderate consumption of coffee and beer is beneficial to health, it appears that the latter helps us live longer. Recently, the Department of Microbiology and Molecular Biology at the University of Tel Aviv in Israel, found that beer can prolong life expectancy , while coffee shortens. By analyzing a yeast share important genetic similarities to humans, the researchers concluded that caffeine shortened the overall length of telomeres. Beer, by contrast, extends. Telomeres are the ends of chromosomes. These are crucial in protecting the genome of the cells, which is essential for the proper functioning of cells. Thus, the study suggests that a cup of coffee contains enough caffeine to shorten the length of telomeres, while an alcohol concentration of between 5 and 7%, similar to the one containing a common beer, he lengthened. Of course, this does not mean that researchers suggest that humans must take a greater amount of beer and coffee decrease. On the contrary, we should not forget the benefits that the latter has. Therefore, although this study tips the scales in favor of beer, even more studies are needed to give us more information . But for now we can ensure that the beer seems to help us live longer. Related ItemsBeerCoffeeDrinksHealth and FitnessWhat helps you live longer?